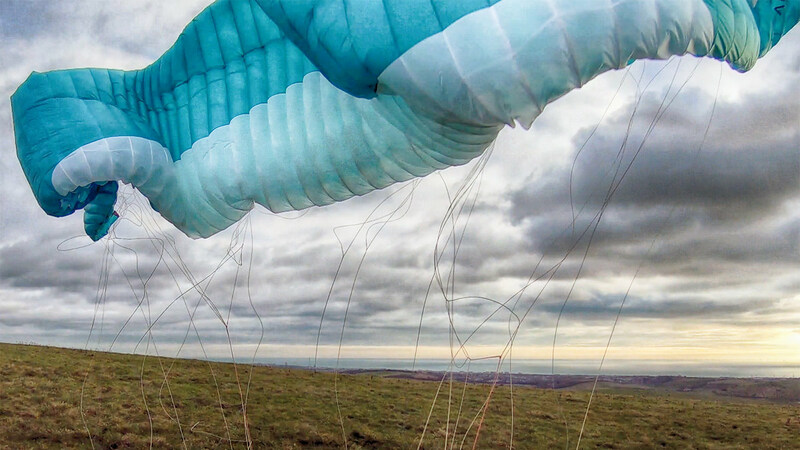 Landing in strong winds can be scary, but it doesn’t need to be dangerous. In this article we’ll get you prepared with techniques for a safe landing setup and the best methods to kill the power and disable the wing. For our purposes here, ‘strong’ wind is anything above 30km/h; ‘extreme’ is over 40km/h, when you’ll be landing backwards. If you expect to be landing backwards it’s probably best to avoid flying, but sometimes the situation can sneak up on you, as a strong seabreeze undercuts you, a gust front pushes out from a rain squall, or you misjudge the acceleration through a narrowing in the landscape. 1. Avoid turbulence upwind. Trees, building and terrain can produce turbulence that can carry a long way downwind in the ground layer of air. Expect a wash of unpredictable air currents down low. To give you the best chance of a safe touchdown, move over long open landing channels aligned with the wind direction. 2. Position yourself using speedbar whilst still high. When you are nearing the ground it is better to back off the bar somewhat to reduce the severity of a collapse. In strong winds it is best to approach landing areas from the upwind side and complete your final positioning by drifting back. 3. 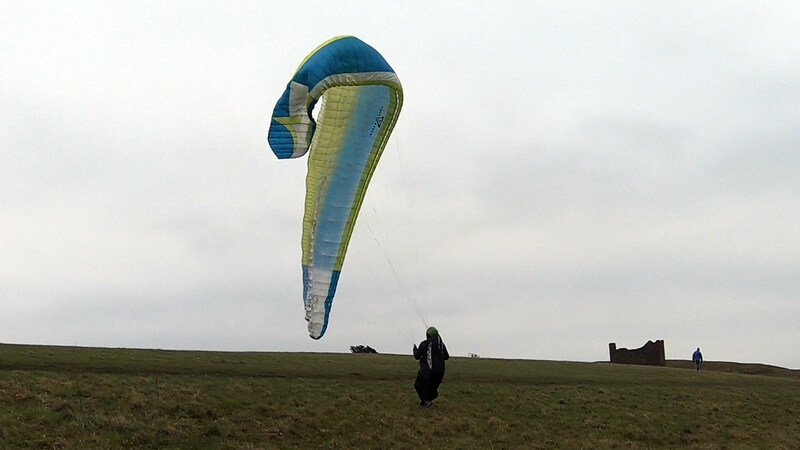 Avoid obstacles downwind. Make sure you’re not landing close to a road, ditch, fence or people, because if you fail to control your wing you might get dragged fast downwind. 4. Legs down early. The biggest risk of encountering turbulence is near the ground. Getting into landing position removes one of the steps so you can focus on the touchdown. The PLF (Parachute Landing Fall) is a good technique for dispersing the impact energy when you fall from a height and is the best approach if you are coming down hard. But in strong winds and whenever you have high horizontal speed, try to stay on your feet and run or ski. 1. Hammer the brakes. This is what most pilots do, but it is risky. If you flare as normal, the wing pitches gently back, and as you touch down it begins to drag you. The wing can power up and be very hard to stall. To prevent this, you need to deliberately induce a harder-than-normal landing (make the wing pitch forward a little) and use the ‘wrap and punch’ flare that is deep, instant, and ‘a little bit late’. Aim to bend your knees and sink down, which gives you a moment of reduced power as you turn and run at the wing (wrapping the brakes further as you go). 2. Rear risers. This varies depending on your wing design, but for most pilots it’s the risers that your brake pulleys are attached to. If you have A B C risers, pull the Cs. If you have A B risers then use Bs. Older wings: if you have A B C D risers, pull the Cs, or possibly, C and D together. Leave the brakes alone and do your final approach using the back risers to make gentle corrections. Grip the rear risers at the maillons. Then as per (1) above, but using the rear risers, which will give you a sharper stall and better control of the wing on the ground. 3. Full frontal collapse. This works on most wings, but two-liners and reflex wings (paramotoring wings, with trimmers released) might present difficulties as they don’t readily front tuck. Tandem pilots might also find they don’t have sufficient strength to induce a proper frontal. For everyone else (most pilots) this is a brilliant technique, because it accelerates the wing at the moment of touchdown which gives you an improved depower. You don’t flare with this technique, as you lack groundspeed. As your feet touch the ground, yank the whole A riser set downwards, release turn and run at the wing, pulling the brakes. The wing flies itself down, so you are not powered up and dragged. You get a ‘long moment’ with no power which allows you to find your footing and run to your wing. If you do the frontal weakly and then do weak brake input, this will fail. If you frontal before you’re on the ground, you’ll be tipped back and get dragged on impact. If you wait too long to do the frontal, the wing will be tipped back and inducing a nice tuck becomes tricky. Timing is important, but it is a simple technique and very reliable. You need strong wind to practice the full frontal technique. In moderate winds the wing will land on your head or wrap you in lines. The strong wind pushes the wing and lines away from you as it falls to the ground. Got it wrong? Getting dragged? If you’ve fallen over and you’re facing a drag race, you need to get at least one brake in. Pulling it in ‘hand over hand’ is bad advice, this is hard to achieve. Simply wrap one brake (rotate your wrist to loop the line over your hand), and keep wrapping. You’re safe from line burn with this method and there’s less power than trying to pull in any riser. Practice doing this next time you’re on launch. See how fast you can wrap the brake line until you reach the point where the brake fan begins. At that point the wing will be disabled. 1. Assisted landing: Get another pilot to grab your brakes and step into wind. 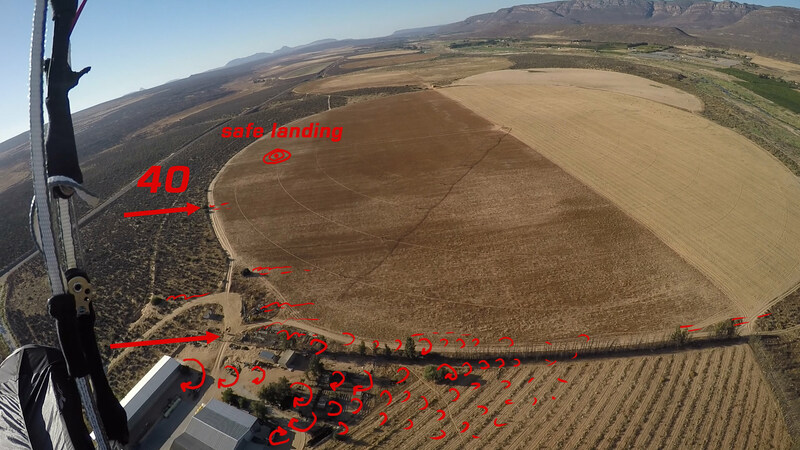 This is easiest to arrange when the wind is close to your trim speed (usually about 37km/h), because then your assistant does not need to run around. This is used by tandem pilots around the world because it is so effective. Make sure you get your hands out of the brake loops before touching down so you can pass them cleanly and symmetrically to your assistant. 2. Quick-out carabiners: These carabiners release the wing when the safety mechanism is triggered. These are highly recommended for tandem pilots and pilots going on world record distance attempts when landing in extreme conditions is likely. Note that on solo wings you’ll need another set of release pins for your speedbar system. It is usually sufficient to release only one side of the wing. 3. One A one C: this creates an asymmetric collapse which rotates the wing, and the C (or wrapped brake on) one side stops the rotation. Timing is more critical than the full frontal, you lose the advantage of accelerating the wing and letting it fly down to the lower wind layer, and the resulting rotation can be tricky to control exactly and leave you with an inverted wing in the wind. 4. 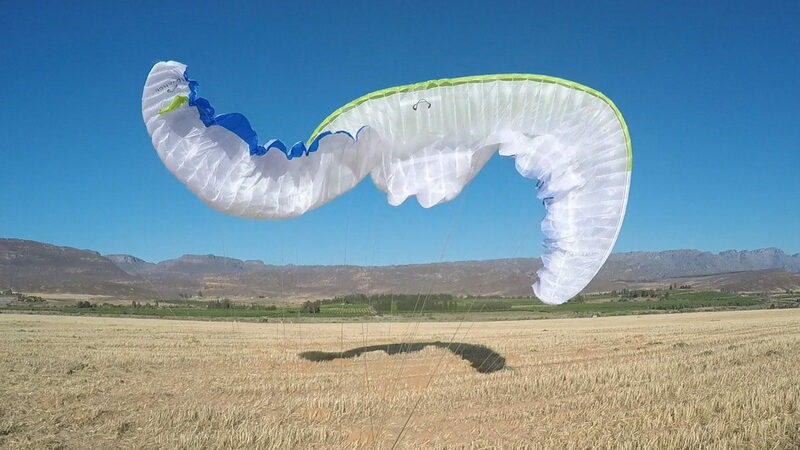 Reverse cobra: let the wing fall over to one side (edge of the wind power window, like kitesurfers do) then rotate your hips to face the wing and run towards it as you pull / wrap both brakes. This is more suited to landing on lifty slopes and winds 20-30km/h, because in extreme winds it can really accelerate you across the ground in an arc as you tip the wingtip over. 5. Unclip: we mention this because you might hear about it. 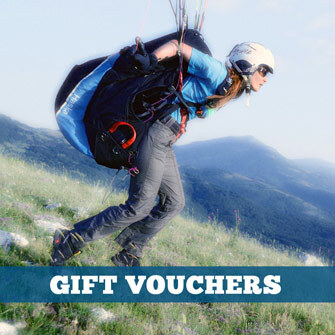 We can’t recommend this, but some pilots have been known to unclip all the buckles on their harnesses (easier to achieve with an upright harness) and jump out at the very last instant, holding the brakes. It’s effective but you lose your harness impact protection so you better be sure you’ll stick your superhero ‘arrival’. The big risk is you might get a nasty collapse in the ground wash layer and get tipped out of your harness, which would be fatal. I might consider this if landing in a lake, snow or the sea. 6. Switched C’s: This landing suits extreme conditions (going back fast) in a desert or beach, where the surface is easy to slide on. Let go of the brakes, twist around (yaw your harness) to face the opposite direction, and control the wing on the rear risers (a la Mike Kung style). As you are facing the direction you are travelling you can be more accurate, you won’t fall over on touchdown so easily and you can slide on your feet as the wing depowers. Don’t flare, sink down, then punch the C’s as before, and keep your body position in the tucked downhill skier position with a low centre of gravity. If you’re awesome, you could even do a full frontal on touchdown instead. Send us the video, we don’t have this one on file :-). Whatever technique you settle on, make sure you practice it regularly. All you need is a big field, a beach, and a wing. There’ll be enough to concentrate on when landing in strong wind, so be sure you’re prepared by having a quick killswitch.